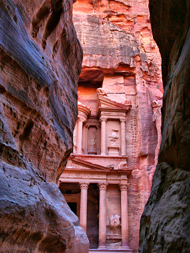 Welcome to Jordan, home of Petra Jordan. In addition to eight months of sunshine, Jordan provides fantastic terrain diversity that creates a perfect setting for an outdoor adventures or a sightseeing tour. The country holds limitless potential for those who appreciate nature and the simplicity of living. There are many unbeaten paths… a country to be discovered! To help you plan your Jordan holiday, we have created this section to provide you with Jordan travel information in addition to an overview of Jordan's sites of interest and an insight into the types of outdoor activities and adventures holidays that you can undertake during your stay in Jordan.